If you need 5 Wire Multiple Outlet Feeder Cords, we have them! Catalog Number: 100ft. 10/5 SOW Feeder Cord w/ 20A 120/208 Plug Catalog Category: Feeder Cords Length: 100 Gauge: 10/5 Jacket Type: SOW Jacket Material: RUBBER Plug: L21-30 Outlet(s) A: L21-30 .. Catalog Number: 100ft. 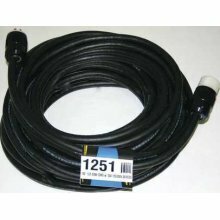 12/5 SOW Feeder Cord w/ 20A 120/208 Plug Catalog Category: Feeder Cords Length: 50 Gauge: 12/5 Jacket Type: SOW Jacket Material: RUBBER Plug: L21-20 Outlet(s) A: L21-20 ..
60ft. 12/5 SOW Feeder Cord w/ 20A 120/208P Catalog Category: Feeder Cords Length: 60 Gauge: 12/5 Jacket Type: SOW Jacket Material: RUBBER Plug: L21-20 Outlet Quantity A: 12 Outlet(s) A: 5-20 .. Catalog Number: 90ft. 12/5 SOW Feeder Cord w/ 20A 120/208 Plug Catalog Category: Feeder Cords Length: 90 Gauge: 12/5 Jacket Type: SOW Jacket Material: RUBBER Plug: L21-20 Outlet Quantity A: 12 Outlet(s) A: 5-20 ..